A familiar refrain during the fall: The Watertown field hockey team, which hasn’t lost in five years, celebrates a Division 2 state title. Cardarelli earns her second Player of the Year honor after scoring 24 goals with 15 assists to lead A-B to a 21-1-1 season and the North sectional title. She finished her career with 80 goals and 42 assists and will play field hockey at Providence College. Winning a state title every year is quite an accomplishment, but Doggett has never even lost a game in her career. The MVP of the Middlesex League, she’s tallied 38 goals and 49 assists in her career, and is part of Watertown’s 115-game unbeaten. Cardarelli joined with her sister Eleana to lead A-B to the Division 1 state title in 2012 and the North title this fall. Leah potted 24 goals and added 16 assists this year while earning her second All-Scholastic honor. She has committed to Michigan for field hockey. Already a two-time All-Scholastic, Dennehy helped lead Weston to the Dual County League Small title for the third straight year. The midfielder scored 24 goals with 14 assists for the Wildcats. A three-time DCL All-Star, she has committed to play at Boston College. At cernter-mid, Feeley was the Bay State Herget MVP and helped lead the Porkers to the Division 1 state title with 22 goals and 27 assists. A National Honor Society student and member of the basketball team, she will play field hockey at Amherst. The Tri-Valley MVP, Gannon helped lead D-S to the program’s first ever South Sectional title. For the year she tallied 15 goals and added five assists for the TVL champs. An honor roll student, she also plays lacrosse at D-S in the spring. The MVP of the MVC, Gross helped lead Andover to a 13-1-4 season while earning her second MVC All-Star nod. A three-sport star, she also plays ice hockey and lacrosse at Andover. She will play lacrosse at Colorado next fall. Only a junior, Haberl has been a force in the Atlantic Coast League for three years, capturing league all-star honors each season. This fall she had 10 goals and 9 assists, A three-sport star, Haberl also plays ice hockey and lacrosse and has committed to play field hockey at Fairfield. Ives helped lead Masco to an undefeated regular season and the Cape Ann League title. Her 27 goals and 18 assists this year helped earn her CAL co-MVP honors. A National Honor Society student, she also plays lacrosse. She will play field hockey at Assumption. No matter the sport, scoring comes naturally to Layo. This fall she tallied 22 goals and 14 assists to lead the ACL in scoring. She finished her career with 144 points. A three-sport star, she is also a leading scorer in lacrosse and ice hockey. Loprete helped lift the Raiders to their fifth straight Division 2 state title. She already has 46 goals and 29 assists for her career, which includes this year’s Middlesex MVP selection. She also plays lacrosse and was Middlesex League MVP in ice hockey. Loranger scored a team-record 35 goals this season and added 12 assists while helping lead the Lakers to an undefeated regular season, the South Coast Conference title, and a spot in the Division 2 South final. The National Honor Society student also plays basketball and lacrosse. Mackintire, the ISL MVP, helped St. Mark’s become co-champions of the ISL and win the New England Class B crown. The honors student is a member of the US under-19 national team and will play at Duke next fall. Matherson was an almost unstoppable scoring threat this season, recording 42 goals to help lead Walpole to another Division 1 state championship. A three-time BSC All-Star, she ends her career with 133 goals and 48 assists. A high honors student, she will play at BC. A prolific scorer, Quirk earned Bay State Carey MVP honors this year thanks to her 17 goals and 23 assists. A two-time BSC All-Star, she also runs track and plays lacrosse. An honor student she will play field hockey at Princeton. Renzi scored 14 goals as a senior, including four game-winners, and notched 13 assists. She earned All-League honors, was named to the NEPSAC Class C All-Tournament team, and was a Globe All-Scholastic in 2011. Renzi will play field hockey at Boston University in the fall. A three-time All-League player, Sgroi was voted team MVP after Newton Country Day won the league title. She had eight goals and nine assists this season and was selected to the All-NEPSAC Class C tournament team. Smith helped lead Duxbury to an undefeated regular season and a Patriot League title while netting a school-record 30 goals and adding 31 assists. She had 16 games with multiple points this season. A National Honor Society student, she will play field hockey at Yale. Storms helped lead Apponequet to the Division 2 South final and the South Coast Conference title this year. She was a force offensively, tallying 34 goals and 20 assists for the Lakers. She is also a standout lacrosse player at Apponequet. The MVP of the Northeast Conference, Woods tallied 11 goals and 18 assists for the Panthers this year, while earning her fourth straight NEC All-Star award. The team captain ends her career with 30 goals and 59 assists. She will play field hockey at Louisville. A proud Walpole graduate, class of 1976, Murphy earned her second Globe Coach of the Year award after leading the Porkers to the Division 1 state title. In her 12th year, Walpole posted a 23-0-1 record and she now has more than 200 career wins. In her 11th year coaching, Johnson helped lead Dover-Sherborn to the school’s first ever South Sectional title, while also capturing the Tri-Valley League title with a perfect 14-0 record. The 1987 Northeastern graduate has been the TVL coach of the year three straight times. Atlantic Coast — Dennis-Yarmouth: Jess Benoit, Rachel Bunce, Allie Moulton, Tori O’Dea, Katelin Oberlander. Falmouth: Madison Haberl, Anna Losordo, Maggie MacDonald. Marshfield: Meghan Creedon. Nauset: Julia Collette, Shaye Ellard. Plymouth North: Tess Fasenello. Plymouth South: Bri Gallagher, Allison Rogers. Sandwich: Claire Gauthier, Maggie Layo, Nicole Martin, Mallory Whelan. Bay State — Dedham: Amanda Carilli, Samantha Girard. Framingham: Stephanie Lopez, Kristin Wilder. Milton: Sophie Chase. Natick: Kayla Donahue, Meredith Galaid. Needham: Allie Brinkhaus, Lexi Quirk, Alli Rubin. Newton North: Nicole Quinn, Amanda Smith. Norwood: Sheila Carroll, Samantha Hayes, Lisa Moynihan, Kacie Smith. Walpole: Caroline Feeley, Molly Lanahan, Brooke Matherson, Ashley Waldron. Wellesley: Sarah Goss, Julia Lesnick. Big Three — Brockton: Daje Brinson, Jordan Falandys, Fallon Raithel, Alex Sylvia. Durfee: Tatiana Paz, Jesse Viera. New Bedford: Laura Brito, Haines Duff, Rylie Indio, Bianca Melo, Mia Pelletier, Brianna Pereira. Cape Ann — Amesbury: Amanda Schell. Hamilton-Wenham: Eliza Webber. Ipswich: Ali Bouvier, Phoebe Howe. Lynnfield: Tara Doherty, Bailey Fanikos. Manchester Essex: Anne Heffernan, Taylor Meek, Brittany Smith. Masconomet: Maddie Doyle, Belle Ives, Harrison Kent, Julianna Kostas. Newburyport: Marie Cahalane, Mary Pettigrew. Rockport: Heather MacArthur. Saugus: Lindsey Canniff. Triton: Emily Hirtle. Dual County — Acton-Boxborough: Maggie Bettez, Eleana Cardarelli, Leah Cardarelli, Cara Conery, Kathryn Salemme. Bedford: Allison Barnes, Mary Kalb, Rebecca McDermott. Concord-Carlisle: Melissa Hoey, Sophie Mazur, Meaghan Teitelman. Lincoln-Sudbury: Whitney Hartstone, Laura Holdman, Abby Kawola. Newton South: Katie Doran, Kaitlyn Moloney. Waltham: Paige Hovsepian, Taylor Scafidi. Wayland: Emily Barnard, Gianna Fargnoli, Maddison Kieffer, Mary Murray. Westford: Allison Avery, Anna Collins, Allia Connolly, Erica Mattila. Weston: Elizabeth Dennehy, Ainsley Gilbard, Morgan Griffin, Eliza Peters. Eastern Athletic — Bishop Stang: Tyler Pelletier, Hannah Scanlon. Martha’s Vineyard: Aubrey Ashmun, Ket Dorr, Mary Ollen. Somerset Berkley: Casey Chodkowski, Jillian Hyburg, Zac Raposa, Jessica Wilding. West Bridgewater: Ashley Congdon, Lena Gee, Emma Kincaid, Priscilla Martinez, Ally Mills. Westport: Jenny Sherman. EIL — Bancroft: Gabby Peterson. Berwick: Isabella Eldridge, Julia Mini. Concord Academy: Becca Miller, Austen Sharpe. Dana Hall: Nicole Barbieri, Elizabeth Connolly, Bailey Rayment. Newton Country Day: Nora DeSimone, Caroline Dubuque, Margaret Fee, Sophia Sgroi, Sara Taylor. Pingree: Kelsey Dion, Solina Powell, Jillian Witwicki. Portsmouth Abbey: Brooke Kazama, Taylor Lough. Winsor: Lili Bierer, Grace Hanrahan, Allegra Pellegrino. Hockomock — Attleboro: Alexa Harvey, Alanis Tirabasi. Canton: Alex Dillon, Mary McNeil, Jackie Merrigan, Kellie Stigas. Foxborough: Katie Notarangelo, Jackie Touzos, Lindsey Venuto. Franklin: Maddie Bressler, Tara Doherty, Kelly Dubowski, Marta Versprille. King Philip: Danielle Hamilton, Paige Kuchy. Mansfield: Colleen LaRose, Janet Maher, Allie Skinner. Milford: Louisa Stansbury. North Attleborough: Kacey Brabants. Oliver Ames: Molly Cunha, Hannah Friend, Cassie Gavin. Sharon: Bridget Loftus. Stoughton: Michelle Connolly. Taunton: Amie Souza. ISL — Brooks: Alesandra Miller, Jackie Murphy. BB&N: Rebecca Moore, Cara Najjar. Governor’s Academy: Kiley Coffey, Maria Krull. Middlesex: Juliana Fiore, Sarah Tabeek, Madeleine Winslow. Milton Academy: Kat Fearey, Cameron Park. Nobles: Maddie Ayles, Catherine Kurtin, Emily Ott. Rivers: Ellie DiCaprio, Jamie Navoni. St. George’s: Katelyn Hutchinson. St. Mark’s: Alexa Mackintire, Sophia Millerick, Maddie Torgerson. St. Paul’s: Caroline Gettens. Thayer: Julianne Landry. Lighthouse — Nantucket: Magan Fales, Cara Godlesky, Mackenzie Holdgate, Mikayla Molta, Joelle Viera. Merrimack Valley — Andover: Louisa Gross, Mikayla Panneton, Nicole Schena. Central Catholic: Molly Bryant, Caitlin Derrickson. Chelmsford: Rachel Bossi, Madison Dallmeyer, Libby Mercuri, Baylee Stone. Haverhill: Rakel Tavitian. Lowell: Madison Alcorn. Methuen: Caroline Crowe. North Andover: Emma Johns. Tewksbury: Hayley Sutherland. Middlesex (Freedom) — Burlington: Jordan Mathieson. Melrose: Carly Sullivan. Stoneham: Lauren Gallahue, Katherine Savoia. Wakefield: Amy Pacitto, Marie Peduto, Miriam Wood. 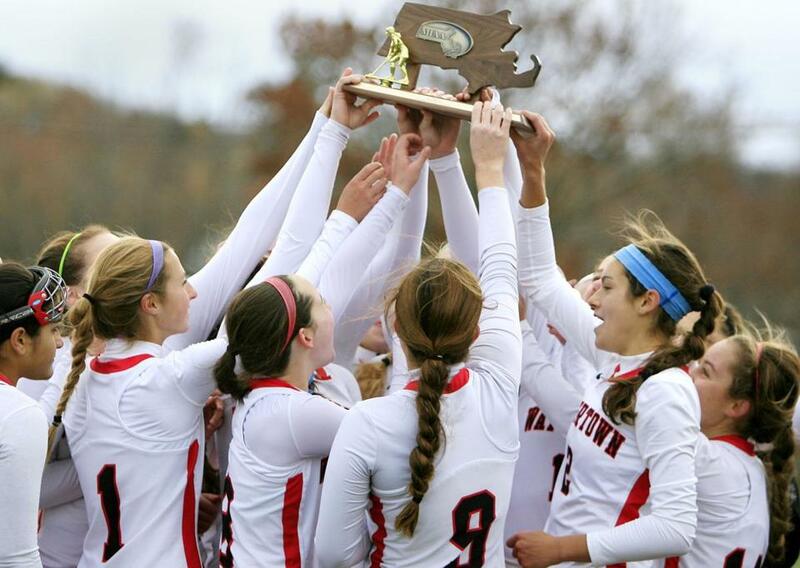 Watertown: Michaela Antonellis, Rachel Campbell, Allie Doggett, Kourtney Kennedy, Emily Loprete, Ally McCall. Wilmington: Jocelyn Cornish, Jessica Marciello, Katherine McKenna, Amanda Richards. Middlesex (Liberty) — Arlington: Mary Grace Cronin, Melanie DeAlmeida. Belmont: Annmarie Habelow, Suzanne Noone. Lexington: Zelda Bank, Flora Cho, Fiona Fitzgerald, Allie McNabb, Pippa Offerhaus, Morgan Zeller. Reading: Kate McCarthy, Jamie Melley, Ashley Tango, Rachel Thomson. Winchester: Zibby Williams. Woburn: Adrianna Manzi. Northeastern — Beverly: MaryCate Flaherty, Kate Silvestri, Nicole Woods. Danvers: Nicole Kamens, Katherine Leonard, Nicole Papamechail. Gloucester: Julia Lamoreaux. Marblehead: Eliza Fitzgerald. Peabody: Noelle Koch. Salem: Joanna Coleman. Swampscott: Tori Thistle, Nora Walker. Patriot — Duxbury: Zoe Griffin, Ally Hammel, Katie Smith, Lily Smith, Meredith Wright. Hanover: Marie Ribandeneyra, Samantha Taylor. Hingham: Ana Giarrusso, Catherine Linehan, Victoria Messina, Katie Sullivan. Middleborough: Haley Andrews. Pembroke: Hannah Burns, Laura Martynowski, Maddy Reardon. Scituate: Maria Garman, Madeline Ryan. Silver Lake: Rachel Gillis. South Coast — Apponequet: Lizzie Loranger, Jade Rodrigues, Cara Storms. Bourne: Emily Cheney, Jenna Sundquist. Case: Penelopy McCarthy, Steve McCarthy. Dighton-Rehoboth: Savanna Michener, Catie Noons. Fairhaven: Allie Berntson. Old Rochester: Abby Bentz, Jessica Kocur, Darby Nolet. Seekonk: Lucy Belt, Jenna Smith. Wareham: Emily Bacchiocchi. South Shore — Carver: Mackenzie Gray, Rachel Lauzon. Cohasset: Mackenzie Axelson, Valerie Farren, Caty Gilman, Ally Lahey. East Bridgewater: Courtney Brown, Mikayla Kingman, Lizzy Leblanc, Lindsey Wolfe. Hull: Brittany Gianibas. Mashpee: Kelly Kalagher. Monomoy: Gabby Crowell, Yasalie Figueroa, Madison Lucarelli, Brooke Wrightington. Norwell: Rebecca Bates, Elaina Cipriano, Lindsay Rober. Tri-Valley — Ashland: Caitlin Graves. Bellingham: Melanie Kaleta. Dover-Sherborn: Caroline Bono, Abigail Gannon, Molly McGill. Holliston: Emily Hagen. Hopkinton: Emma Flaxman. Medfield: Michelle Diggans, Marinda Horan. Medway: Katie Peters, Brooke Roberts. Westwood: Kasey Keane, Jamison O’Neill. Class A — Deerfield: Lucy Lytle. Greenwich Academy: Sasha Fritts, Annie Leonard, Maggie Schmidt. Hotchkiss: Grace Jennings, Bailey Mertz. Nobles: Allee Ayles, Catherine Kurtin, Lexi Laing, Emily Ott. Taft: Audrey Quirk. Westminster: Ashley Carbone, Brooke Wolejko. Class B — Berkshire: Olivia Good. Brooks: Alesandra Miller. BB&N: Cara Najjar. Cushing: Kylie Caouette, Donovan Foote, Samantha Reynolds. Loomis Chaffee: Hannah Oganeku. Middlesex: Juliana Fiore, Sarah Tabeek. St. Mark’s: Alexa Mackintire, Sophia Millerick, Tatum Schultz, Maddie Torgerson. Williston Northampton: Morgan Fisher. Class C — Greens Farm: Maggie Sherin. Gunnery: Kayla Meneghin, Katlyn Paiva, Hannah Rose Michalik. Holderness: Hedi Droste, Tess O’Brien, Alexandra Renzi, Alexandrea Solms. New Hampton: Dempsey Arsenault. Newton Country Day: Victoria Iannella, Sophia Sgroi. Proctor: Kate Pattison. Rivers: Maura Crowley, Melissa Maffeo. Winsor: Ellory Laning.